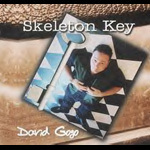 I've been writing for Sorted for about a year and a half and this is the fourth album by David Gogo that I've gotten in that time. He has some work ethic, you have to give him that. Thankfully on "Skeleton Key", his fifth for Cordova Bay, he's plugged his electric guitar back in and left his acoustic blues period (the regrettable "Bare Bones" album) in the past. '(Just ask) Jesse James' isn't the strongest of opening tracks and it isn't until the crazy tom-tom work of track six, 'Walkin'', that things take a turn for the better. From there on in it's all rock n' soul ('Reap what you sow'), slow burning numbers ('Signed, sealed, delivered') and guitar licks aplenty ('It don't make sense (that you can't make peace)'). Gogo's vocals are, yet again, as unmistakable as ever, raw yet filled with emotion. Close your eyes and return to that same run down, dusty, whiskey bar that he's brought you to so many times before. Granted it's not as instantaneous as "Change of pace", his most rock-orientated album to date, but it's a strong follow-up to last years 'Halfway to Memphis'. The road signs all read "the blues" and Gogo's taking careful note as he cruises past with the top down, some light soul on the radio and a headful of major key, blues riffs just waiting to burst out.